Clockwise from top: Sweet Pea, Snapdragon, Poe, and Clara Barton. Like I say, they’re getting along pretty well. 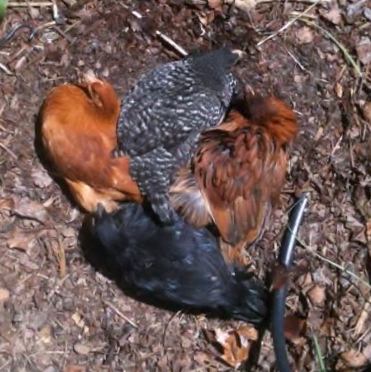 The girls were happy to roll in last year’s mulch and freshly scratched dirt in the warm sun today. They had chopped pear and strawberry and banana for a treat, and I cleaned the coop and changed their water. I told them all this would result in a sun-kissed complexion and I think they bought it. As I weeded a flower bed they stayed close by, making their clucky sounds, picking at the weeds as I pulled them and tossed them behind me. I occasionally offered them an earthworm. Sweet Pea, the Barred Rock, took one from my hand. The others thought about it and declined the offer, though Clara tried hard to get her nerve up. She would get 6 inches from my hand and leap back. I think the leather glove put her off. But they all followed me back to their pen as I dropped a trail of dried worms. I felt like the Pied Piper, only with worms instead of a magic flute. And I led the birds to safety, not to drown in the river like the rats of Hamelin. Never mind, poor analogy. The girls positively glowed after their little spa day. Photo of dirt bath provided by my hubby, John. ← Ten Thousand and Counting!